As many of you are aware¦ I am not the typical financial talk radio host that tells you that if you make use of credit cards or a home equity loan your wallet will catch on fire and your first born will be promised to the issuing bank or credit union. No I personally make use of both credit cards and the large sum of equity that I have in my personal residence. I responsibly pay my credit cards off each month, but thoroughly enjoy the $1,200 to $1,500 of annual rewards and cash back that I receive. I also use my home equity as a tool that allows me not to keep huge sums of cash sitting on the sidelines just in case I need money for an emergency. I want as much of my money working for me at all times, so that eventually my army of working dollars earns more than I can make with my back, hands, and brain. Let’s face it: Investment income that is automatic and pays your monthly bills can open your life to many more opportunities as well as complete financial independence. However, I am quickly realizing that many have gone too far in the use of debt. Just as Alan Greenspan spoke of the late 90s equity markets with the words, irrational exuberance, I think that we can use the exact the same logic and apply it to the average person’s use of debt. Many have taken the tool of debt to levels that are now causing them to sink into financial ruin. This is unfortunate and we need to pay close attention to this trend because it will directly impact the performance of your investments and the financial markets. The dirty little secret about our recent economic growth is that most of it has been provided on the back of consumer spending. Americans have had a healthy appetite for new cars, homes, electronics, and eating out. All of these activities and purchases have driven the engine of the economy, and as a result corporate earning have been good and even exceeded expectations. Voting in favor of the policy announcement were: Ben S. Bernanke, Chairman; Timothy F. Geithner, Vice Chairman; Richard W. Fisher; Thomas M. Hoenig; Donald L. Kohn; Randall S. Kroszner; Frederic S. Mishkin; Michael H. Moskow; Eric Rosengren; and Kevin M. Warsh. In other words, I think they meant the following….Oh we might have misjudged how drunk on debt the banks and consumers of America have become. The thing about this statement that bothers me is that I do not want the Federal Reserve to jump to action too soon. There are a lot of bank and individuals that knew what they were doing when they hung it all out there and essentially gambled with credit. These people need to feel some pain, so that the market can adjust and become healthier and grow to new highs. If the government jumps in too quickly to save these individuals, the activity that has led us to this period of huge market swings and volatility will not have been corrected. It is essentially a slap on the wrist or like a doctor giving a patient a steroid instead of treating the actual cause of the sickness. Sure the patient feels good in the short-term, but ultimately the sickness has not been cured.Â This could be exactly what happens to our Financial Markets if the Federal Reserve acts too soon. Sure it will make us all feel good in the short-term and even level out the market volatility, but this could have a very negative impact to the economy in the long-term.Â If you need proof go review what happened to the financial markets in the late 80s that led to the recession of 1991 (does the Savings and Loans bail out ring any bells?!). Evaluate whether the money that you have invested is long-term money (money that can be locked away for > 5-7 years) or short-term money (money that will be needed within the next 3 years). If the money is for long-term purposes such as retirement or the education of your 3 year old, then relax and look at this as a positive (you are getting a discount on what will be worth much more in the future). 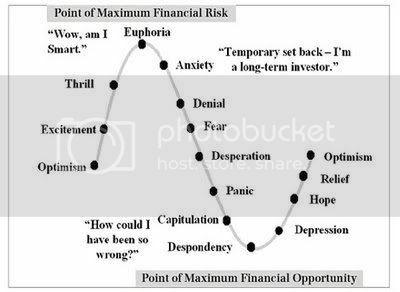 Below is a visual of the Emotions that an individual feels during a typical market cycle. Do not fall pray to your emotions. Remember simple statements such as “Buy Low and Sell High”. This does not work if you get flustered at the first sign of trouble and head for the exits.